Cake is a term with a long history, the word is of Viking origin from the old Norse - "Kaka". Cake denotes a baked flour confection sweetened with sugar and honey; it is mixed with eggs and often, but not invariably, with milk and fat and it has a porous texture from the mixture rising during cooking. The distinctions between bread, bun and biscuit are blurred as techniques for baking and leavening developed and eating patterns changed. Some Roman breads were enriched with eggs and butter and much have reached a cake-like consistency although still named as breads. According to food historians, our modern carrot cake most likely descended from Medieval carrot puddings enjoyed by people in Europe. 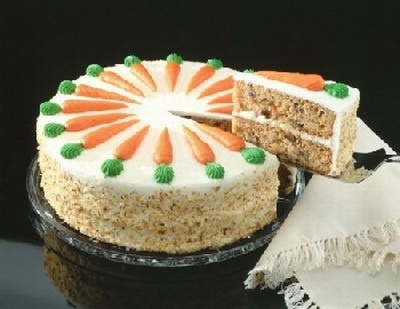 No one really knows where carrot cake came from, It looks like it did evolve from the Carrot Pudding of medieval times, during the middle ages sugar and other sweeteners were difficult or expensive to come by in Britain and carrots had long been used as sugar substitutes. Carrot Pudding history here. In her New York Cookbook (1992), Molly O'Neill says that George Washington was served a carrot tea cake at Fraunces Tavern in lower Manhattan. The date: November 25, 1783. The occasion: British Evacuation Day. She offers an adaptation of that early recipe, which was printed in The Thirteen Colonies Cookbook (1975) by Mary Donovan, Amy Hatrack, and Frances Schull. It is quite close to the carrot cakes of today. Preheat the oven to 350 degrees. Spray a Bundt pan with cooking spray. In a medium bowl, whisk together the flour, cinnamon, baking soda and salt. In a large bowl, combine the oil, sugar, eggs and carrots, and mix well. Add the flour mixture and stir until smooth. Pour the batter into the prepared pan. Bake until a tester comes out clean, about 1 hour. Cool in the pan 2 minutes, then turn the cake out onto a rack to finish cooling." Top right recipe also appeared (word for word!!) in "The Household Encyclopedia",1858, By An association of heads of families and men of science. German national cookery for American kitchens, Henrietta Davidis,1904, included a recipe for Mohrentorte. See Carrot Pudding recipes through the ages here - carrot puddings. The confusion occurs because the term "cake" is fairly recent, probably 13th C and it could be that many puddings were in fact cakes - solid pudding. This is a typical example from the late 17th century. "26. Pudding of Carrot. Pare off some of the Crust of Manchet-Bread, and grate of half as much of the rest as there is of the Root, which must also be grated: Then take half a Pint of fresh Cream or New Milk, half a Pound of fresh Butter, six new laid Eggs (taking out three of the Whites) mash and mingle them well with the Cream and Butter: Then put in the grated Bread and Carrot, with near half a Pound of Sugar; and a little Salt; some grated Nutmeg and beaten Spice; and pour all into a convenient Dish or Pan, butter'd, to keep the Ingredients from sticking and burning; set it in a quick Oven for about an Hour, and so have you a Composition for any Root-Pudding." The Food timeline gives a lot more here. 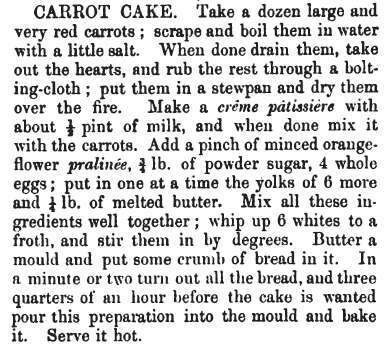 A few Americans claim to have "invented" carrot cake in the early 20thC using recipes from "back home", usually Germany, Russia, Poland etc. My mother was Polish and recalls her grandma teaching her about adding carrots (and other stuff, based on availability) to cakes. So I suspect the eastern Europeans have had it from the 19thC at least. Of course country folk passed on these recipes through word of mouth so documentary evidence is sketchy. One-half pound sugar, one-half pound almonds, blanched and chopped, one-half pound carrots, boiled only till they can be grated, juice and grated rind of one lemon, four eggs. Cream the yolks and sugar; whites beaten to snow, added last; add three or four bitter almonds; beat for one half hour before adding whites of eggs. Butter spring form and sprinkle with grated zweibach. Bake in a moderate oven one and one-quarter hours, till loosed from pan. Through my research of some newspaper archives, I found several sources concerning carrot cake that predate the publication of this cookbook in December 1912. First, The Detroit Times, December 19, 1908, had an article about doctors in London living on a diet of carrots, including "carrot cake." This is indicative that American readers were at least familiar with carrot cake, though the article is discussing London. Second, the Norwich Bulletin, November 19, 1909, has an advertisement for the Haile Club restaurant, in Connecticut, which mentions "carrot cake" on their menu. So, we then see that at least one American restaurant was serving carrot cake, and there isn't any indication that this is a unique occurrence. There isn't any explanation of "carrot cake" either, so they seem to assume that readers would understand what they meant. Third, The San Francisco Call, February 25, 1912, has a letter from a woman seeking a recipe for a "good carrot cake." 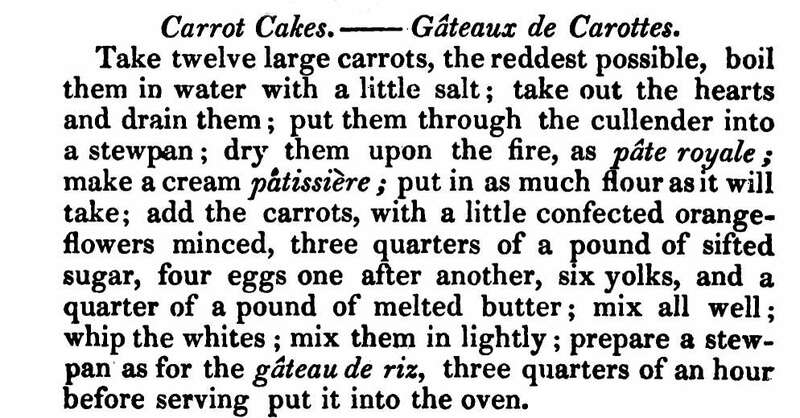 And finally, and most significantly, there is a reference which provides a carrot cake recipe. The Honolulu Star-Bulletin, December 21, 1912, printed a recipe for "Crocus Carrot Cake," which was sourced from the Ladies Home Journal. I'm not sure why "crocus" is used in the name as that plant has nothing to do with the recipe. Though this recipe appears to be simultaneous with the The Neighborhood Cook Book, the original recipe appeared in the Ladies Home Journal, November 1912, predating the recipe from The Neighborhood Cook Book. When did the cream cheese icing appear? The earliest American print references to frosting carrot cake with cream cheese are from 1960's: Some eastern European cultures, have cream cheese cakes and it could well have developed from this, and a lot earlier. Mary Berry's (UK) Carrot and Banana Cake recipe. Directions: 1.Preheat a grilled or large skillet, spray with cooking spray. 2.In a large bowl, stir together the flour, brown sugar, salt, baking powder, baking soda, cinnamon, nutmeg and ground ginger. 3.In a small bowl, whisk together the eggs, whole milk, melted butter and vanilla. 4.Stir the wet ingredients into the dry ingredients until just combined. 5.Stir in the carrots, raisins and walnuts. 6.Pour 1/4 cup batter onto a hot griddle. 7.Cook until the edges start to look dry, and the underside is golden brown, about 2-3 minutes. Flip and cook on the other side until cooked through. Chinese New Year white carrot "cake"
(2) Chop all soaked, softened and drained mushrooms, Chinese sausages, shrimps (if using) into small pieces. set aside. (4) Heat wok [or a large skillet] HOT with 2 tbsp oil. Fry chopped mushrooms, sausages, shrimps or/and scallops shreds for 1/2 min. Dish up and set aside. (6) Add spice, salt, chicken powder, white pepper, toss until evenly distributed. (7) TURN OFF HEAT. Add rice flour on top, now use a chopsticks to toss and mix flour evenly with carrots (about 2 mins). (8) Remove carrots flour mixture onto a greased 9x2 inch deep round cake pan. (10) Slice into pieces and serve hot!! OR cool on wire rack before covering with plastic firm and put in fridge. HAPPY CHINESE NEW YEAR! "Kung Hei Fat Choi"!